Don't be a paranoid idiot, if the Kinect were built to spy on you they did a terrible job at it considering you can turn it off tape up the camera and microphone and throw it behind your TV and never mess with it again. Bubbled down for personal attack. The xbox juan wont work without kinect. sheeple.. Ohh... Hi FordGTGuy :). You trust a company like M$ to never spy on you? PRISM. Bubble down also. get the Xbot!!! You do know you get get things like your laptop webcam hacked. It doesn't need to be MS, but they already got caught doing it with skype, this will be a bride for any clever hacker to gain access to your life. This shows how irrational fanboys can be. It's like they're just trying to find anything now since the no games and drm argument is gone. Do you REALLY think MS is going to sit there and watch you sitting in a chair holding a controller? Don't you think a gaming giant has better things to do? You act like MS is going to be the first to ever release a camera. Having a camera that you can unplug and still use the hardware as opposed to having a camera that is mandatory is different. Yes, MS has better things to do like do a 180, oh right, that already done that. People don't trust MS enough to have kinect as a mandatory piece of hardware, and i don't blame those people. All the negatives MS caused to the Xbox brand is self inflicted. You honestly think MS wont use the kinect to their advantage, that is very short sighted. It already failed as a gaming gimmick, MS might as well use it for other things. That's the stupidest thing I've heard. So since the first Kinect didn't do so well, the second one must be to spy on you? Oh and incase you didn't know, the camera can be turned off when the Xbox isn't on. So tell me this, you seriously think MS are going to dedicate their time to watching millions of people sitting there playing video games. Am I really the only one that thinks this is beyond stupid? Oh yea I forgot I was dealing with fanboys. Don't be silly. Me sitting there playing games is more than enough for MS to bombard me with stupid Nike and Pringles ads because I was gaming while wearing a Nike tee and eating Pringles. Lol it's hilarious seeing the backlash from people now. Before the whole Snowden stuff, everyone on here was laughing at how ridiculous claims of spying was. Now who is laughing? Or crying, or facepalming.. either way doesn't sound so stupid that kinect could be used as a spying device does it now? It's a gimmick just like everything else, PSeye included. Main reason I'm not buying the Bone day one. Forcing me to pay extra for something I don't want. I'd usually agree with you on the pseye but the light bar on the DS4 changes everything. MS said that with connect they could get a better feel for you the user and it will recognize the people in the room and tailor the U.I to you. Personalized ads or movie trailers so in a way yes it is spying on you, but not for what people seem to think. The fbi is never gonna knock on your door " we where watching you through your Kinect and your under arrest"
wait, you don't love kinect ?! That's creepy, I just got Goosebumps. I'm actually quite excited for the Kinect; the voice control bits anyway. THAT IS if they work. Recording, snapping the browser/skype etc. Although saying that, the voice commands on the original Kinect left me wanting to strangle a cat. Kinect being mandatory has a lot of advantages. Obviously developers can cater for the hardware now knowing that every X1 owner has one and the tech itself has been improved. I always imagine for example, playing Mass Effect and using the biotic powers like lift with my hands. Force powers basically. But...lets not talk about THAT Star Wars game. The problem is that everyone is going only off of what they see from Kinect 1 now. Simple solution, Microsoft: make compelling games that make good use of its features. To be fair though, that's far more likely to happen this time around, what with every console coming with one and the device itself being far more capable than it's predecessor. I agree. I am also looking forward to using Kinect 2 with the family like we did with the 360 Kinect. Im also looking forward to seeing what other developers can do with it as we saw some good things with Kinect 1 on games like Forza 4 and Horizon, Fifa 13, Fable Journey ect. Kinect is not the main reason why I am getting the One but it adds extra options to the console and more than less is better. lets not forget that with some simple software updates to the XB dashboard...new and interesting features could be added to utilize Kinect with the TV/DR functions. we are just a few steps away from a minority report type of interface. @Lvl_up_gamer I agree we could be very well on our way to that if MS carry on supporting Kinect. I'll ask this again; is there even an indicator light on Kinect which tells you that its on? I didn't see one.. But , you will be able to tell it's on, when you start to get an uneasy feeling,.. and your dash board is bombarded with personalized ads. I want the Kinect because....I have nothing more to add. Xbox One Day One. Huh? This is defending the Kinect... but I guess you never bothered to read it. Dang, I made myself looking like a fool. I saw the headline and I automatically thought it was a negative article. :/ Thanks for slapping me back to reality Klank. So, rather than even give ONE reason as justification, you essentially say "Just because." And then you rant and rave about others? Are they spying on me too? 2 + 1 = 3 so every natural number plus one is 3, is that what youre saying? Whoa, there! If we're not dividing by zero, I don't know anything about math. THREE things with cameras. Half Life 3 confirmed. Same with Phone, that[s usually in your pocket/purse. are they spying with those?.. probably, will M$? definitely..
-that mentality is kind of like saying -"I used a razorblade to cut my arm,, might as well use a bowey knife, too!" Laptop it's very possible to get hacked actually. regardless how would you even know? That's different. You can disable those and still use your computer and phone. Disable Kinect on the Xbone and it won't work. You have no idea what they're recording really. Maybe the huge cloud system is the way they'll get the data. Save it all to the cloud. Nothing on the cloud is safe from this whole spy problem. MS have backtracked in a good way by hearing what the gamers want.. There needs to be a Two , No kinect, no HDMI in.. Just a gaming console for $350-400. Would it be that hard ? When the One-reveal, happened.. that is what I immediately thought, when they said Kinect.Kamera.Kloud. --that is the TRUE power of the cloud. NSA super cloud data center, is opening this fall. in utah., the Utah Data Center. You can turn Kinect off, cover it, face it away from you, ect, & the system still works. You can't unplug it. No HDMI-in? Why remove that feature?! There's no reason it can't be a games console with HDMI-in. Silly thing to ask for imo. "No HDMI-in? Why remove that feature?! Silly thing to ask for imo." There is a reason.. Cost. FWIW, I have a Home theatre system that has multiple HDMI inputs already... (No,One wont replace them.. AV,360,PS3,TV) Its More than One. Personally, I see the One's Kinnect/TV/Cable/HDMI In- thing as resources miss-used. Neither of those are always on to begin with, so no, not the same. Yeah laptops have a camera on the front and there was an alarming news articles just the other week about hackers viewing those webcams and selling on the feeds. So yes they technically could be spying on you. Also both laptop and phone will operate with broken cameras. yes lets make magic together. Well M$ is anti consumer, anti gamer, anti indie, and anti everything, so for us to not bend over, you really think we are in the wrong? I agree with you somewhat, there were an even number of anti Sony/Microsoft articles before the next gen consoles were even shown. Microsoft put it on themselves, so if you want to blame the amount of negative Microsoft articles coming in, then blame Microsoft, not the site. This is a pro xbox article,, did you read it first? It is stating, how he wishes in the future, every device will follow with camera's and mics.. This is DEFENDING the Kinect, god it's no wonder 'some' people complain about all the 'negative' articles when they don't even bother to read anything. Maybe you should've read the article first, genius. I suppose if you like being spyed on and love gimmicks, then the Kinect is for you. Question: Why would I even want a Kinect? For me Kinect is pointless tech which I'll never use, that's why I don't want one. I don't appreciate ugly and intrusive tech in my living room. It would violate the sophisticated design of my entertainment center. The reason to want kinect is, because it comes with an awesome console that features great games, as well as the best looking game of 2013, Forza 5! 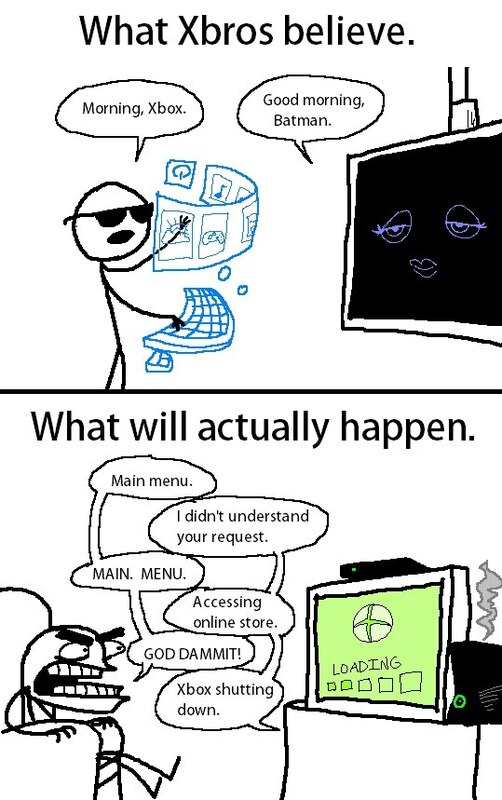 I personally think Kinect has a lot of potential and being someone who has a kid in the house, I actually welcome it. But, I think MS will have a struggle on their hands to win over the masses. The reason for this is Kinect 1/Wii/Move. People have already experienced what they think motion control is, and it they lapped it up, but now most of these accessories/systems are sitting around unused. Many people see this as a gimmick, so will they shell out money again? If MS are going to win the masses they need to be bringing out some intuitive software to really showcase its capabilities. Here we go again with all the fan wars.can't you sony fans be more reasonable. Why all the extra talk. just read the article and leave.no one is forcing anybody to make comments, the article is pro xbox one and yet the comment section is filled with almost all negative comments frm sony fans.its a mater of opinion you don't have to agree with what d article says but why the insults and nasty comments .I noticed when there is an article pro ps4 on this site you don't see this sort of reaction and comments from xbox fans .the other day hideo kojima was insulted by ps fans for sayin he loves kinect and even ted price (insomniac) is being insulted for makin an exclusive xbox one game but when bungie makes ps4 their new platform of choice to demo destiny you don't see xbox fans throwing all this hate.and after reading this article I realised the first comment was a jab of some sort at kinect and the second was in defence of the hardware and from there on the war began. Soon no one will want to come here anymore. A lot of hate here. Damn. I for one will buy both consoles but xbox one first maybe and though I never really liked the first kinect i am very excited for kinect 2 and am looking forward to owning it. Here we go again with the fan wars.. another naive person assuming all the negative responses are Sony fans. I play my Xbox 360 far more than my ps3 and I'm negative in kinect articles.. why? Because I want to buy the Xbone without being forced into spending extra on an accessory I have zero interest in. There are many others in the same situation as me too.. time to accept that the Microsoft/Kinect hate runs a bit deeper than a bunch of ps fanboys. You simply just turn the camera off! Your xbox one will still work with the camera turned off. -----why do people here find this hard to understand? Can you even turn it off? I thought you could only pause it. Either way, why not just let people disconnect it completely from the console and have the console function? Or better yet, not force every Xbox gamer who wants to buy the Xbox One into buying a kinect device. MS want's you to join its obsessive Kinect fetish. The Kinect only caters to exhibitionist and tools. After reading this piece, I'm still left with the question "why would I want a Kinect?." Even an article trying to push and put a positive light on Kinect 2.0 can't come up with a compelling reason for having the Kinect. Just more gimmicks. BTW, if I can tape up and put behind my tv the Kinect and never use it, then I should be able to unplug it and box it up.